I’ll be the first to admit that when jumping into this lifestyle the thing I was afraid of the most had to have been deodorant. I had feared that without the aluminum I would be doomed to be a sweaty and smelly mess. But I was determined and I didn’t want to go back to the harmful aluminum deodorants. I spent a long time using Tom’s Of Maine’s deodorant and found that it left me sweating more than normal and it just didn’t quite work for me, I began to get a bit hopeless and felt it was the only “natural” deodorant I could find. That was until, of course I found Bubble & Bee Organic. Finding Bubble & Bee Organic was like finding a pot of gold at the end of a rainbow. Here was this store that consisted of many organic goodies and I was in all natural heaven! My eyes wandered the shop in excitement as they set on B&B’s Pit Putty. I couldn’t help but find the name funny due to it’s uniqueness and quirkiness which only makes me love it more. I can’t lie that I wasn’t a bit hesitant to try it… What if it doesn’t work for me? I really didn’t want to get lost in the world of finding a natural deodorant again and I was afraid that maybe there wasn’t anything that would work quite like my old deodorant I felt like Goldilocks in search of the just right porridge for me. Was there anything that could keep me smelling fresh? Luckily my fear quickly vanished out once I found out that they offer an amazing deodorant guarantee. If that particular deodorant doesn’t work for you, they will gladly replace it free of charge — all you have to pay for is shipping! It was a win/win for me and I really had nothing to lose. Stephanie Greenwood (the owner of Bubble & Bee Organic) really strives to make her customers happy and is by far one of the most helpful companies I’ve ever found. Not to mention their super fast shipping that still baffles me to this day. Now, let’s get into it. Shall we? 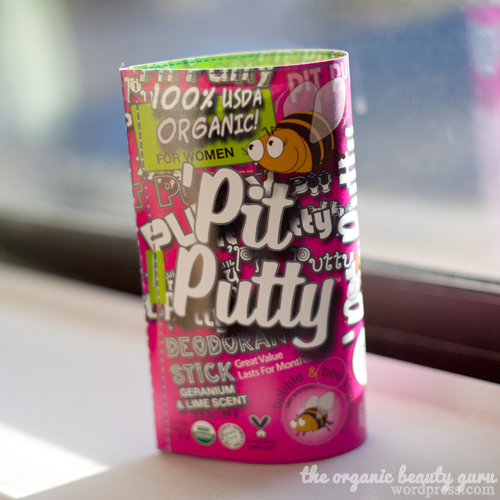 Time to review some Pit Putty!